Concerts: Saturday April 06th 2019 at 8.00pm. 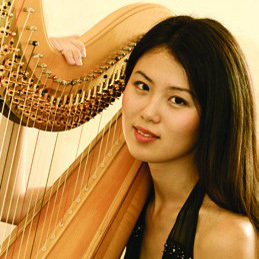 Yinuo Mu is Principal Harpist of the Melbourne Symphony Orchestra. A dynamic, intuitive performer, she has won numerous music awards and solo competitions including the Grand Prize at the American String Teachers Association National Solo Competition and American Harp Society’s Ann Adams Award. Yinuo has appeared as a soloist on a number of occasions, most recently with the Melbourne Symphony Orchestra in 2015. Prior to joining the MSO, Yinuo served as Principal Harpist of the Florida Grand Opera. She has also performed as guest harpist with many orchestras including the Boston, Houston and San Diego Symphony Orchestras, and in Australia with the Sydney, West Australian and Tasmanian Symphony Orchestras.